If you've been following along with my Disneyland trip report, you will remember that we left off with a very sad day two as compared to my normal trip reports. For those of you just joining us, I was a newly pregnant lady of twins, had a health scare on day one of Disneyland which resulted in an ambulance ride to UC Irvine, and then due to how I felt we pretty much only went to Disneyland on day two for about 2-3 hours or so. Not exactly the vacation of my dreams or they way I had imagined my first ever trip to Disneyland, but as I said before....I got to go. Even if it is the only time in my life I ever get to go, at least I can say I went. So on to day three....which would be our first steps into Disney's California Adventure. Unlike yesterday, we had a pretty full day here and a day that I can actually say I was pleased and content with. We pretty much did everything that I was physically able to do. Obviously there are several more things I would like to go back for when I am not pregnant. But overall it was a great day and I accomplished most of what I was planning on. First stop was of course racing over to Grizzly River Run, not to get soaked on the attraction, but to grab a fast pass for World of Color. I missed Fantasmic and the fireworks at Disneyland the other night due to unforeseen circumstances, I was determined that I would not miss World of Color. Once we got out fast passes we decided to head back to the entrance of the park stopping for a Soarin' fast pass on the way, so we could actually look at things at our own pace. I really enjoyed Buena Vista Street. Of course I have nothing to compare it to as I never saw the original entrance to California Adventure, but I've only heard how much it has improved so I think it was safe to say that I liked it. We leisurely strolled along waiting for our Soarin' fast pass return time. We got on Monster's Inc which I thought was cute, took a look in some of the shops and just hung out near Carthay Circle. We rode Soarin' which was the exact same ride that I'm used to from Walt Disney World. Not sure why but I was expecting it to at least be a little different. But no, it is the same ride. However one thing I did notice was that the picture quality was so much better here. Experiencing the attraction in DCA made me realize just how bad some of the scratches/dust on the film in WDW really are. Working our way around the park, past Grizzly River Run and heading towards Paradise Pier, it was here that I finally understood what everyone meant when they said if you stay at the Grand Californian resort you can walk right into DCA. I mean...you literally walk right in. For some reason I had always thought, well yeah it is close but it's still probably a little ways to get in to the park. No, it is like two steps. Absolutely crazy! How lucky would one be to stay in this gorgeous resort? I couldn't believe it. And I wish I could afford it. I really loved the Paradise Pier area. I mean, you see pictures of it and you realize that it is impressive looking but there is nothing quite like standing there taking it all in. I'm not one for carnival rides and atmosphere but man is it gorgeous sitting there on the water. My husband convinced me to get on the ferris wheel although it looked terrifying. I drew the line though at the cars that sway back and forth, yikes! We got on a stationary car and that was scary enough. But I am glad I did it. The Little Mermaid ride was closed and I wasn't able to wait in line for Toy Story...and no fast pass? WTF? So Paradise Pier on this trip was not really a successful venture, however I really did enjoy the time we spent there. Next we headed into Pacific Wharf for a bite to eat. Ugh...eating on this trip was certainly a challenge. I was still in the stage of pregnancy where no food sounds good...ever. I had a heck of a time deciding on a place to go. Since the Wharf had some different options, my husband opted for Mexican, while I went into the Pacific Wharf cafe for a chicken salad inside a bread bowl. It wasn't awful and I'm sure any normal person would find it delicious, but food was such a challenge for me during this week that it just didn't sit as well as I had hoped. But alas, we must press on. And press on we did, right into Cars Land which was indeed as beautiful as they all have said. I have to admit, the idea of Cars Land never got me that excited. I really don't care for Cars at all. The movie was so so to me. Not a repeat watching kind of movie in our house. I understand the draw I guess, but I never felt that a themed land around Cars was a great idea. But I have to admit, it was pretty darn impressive in theming alone. Obviously I could not go on Radiator Springs Racers (huge bummer), I also did not go on Luigi's Flying Tires. In fact we did not do one single attraction in the land. But walking through and experiencing it was an attraction in itself. I made a quick mental note that we needed to come back at night if we could manage it. We walked through Bugs Land quickly, past the Tower of Terror and back towards the entrance. On the way passing the Hyperion Theater where the Aladdin musical was taking place. I was trying to make it to the next show but they had someone standing out front saying that there were technical difficulties and this performance had been cancelled. I was tired, so we decided to head back to our hotel with plans to come back that evening to possibly catch the 6:30 pm showing of Aladdin and then to see World of Color before closing. I got a really nice rest in and we did indeed decide to come back to catch Aladdin. I must say I really didn't enjoy it. I had heard such rave reviews about it and that it was not to be missed. I actually found it a little cheesy and the genie we had was sort of borderline and annoying. I realize he is supposed to be over the top, the character is that way in the film. But I just did not care for this guy. I sort of wanted to punch him in the face. I happen to love Broadway and musical productions of all kinds so this is not a typical reaction for me. This type of attraction is totally not my husband's thing either and he only went because he knew how badly I had wanted to go. I felt sorry for him as I am sure he was on the verge of jumping off the 3rd floor balcony. I just could not get into it. Plus it was rather long and we waited in a very long line that did not let us in on time before getting in there. But as always with any Disney experience good and bad, I am glad that I experienced it for myself to form my own opinion. Enough of that. It was now nearing dark. We walked back over to Cars Land to check it out on our way to wait for World of Color. I take crap night pictures so I won't even bother sharing. It would not do it any justice so we will just leave it at that. But yes, Cars Land at night is even better than Cars Land during the day. We sat outside of Flo's for about an hour on a bench just to rest. It was one of the more beautiful and peaceful moments of our trip. Waiting for World of Color was like waiting for my prince to come. It was never gonna come! It had to be one of the more excruciating waits I had ever experienced. I really shouldn't have been standing for that period of time, I was exhausted, there was no where to sit, and there was a MASS of people. I wanted to make sure we could see well so we did get in line earlier than most. However, the show was just amazing and the highlight of my trip. I cried because I couldn't believe I had made it here. Even through the troubles we had on the first day. I had made it. It was the perfect way to end my experience at Disneyland. I simply cannot wait to go back again. Here's hoping I can make it in the next ten years. It is just so expensive to get out to California for us. Even more so now that we are expecting twins and already have a young daughter. But I can see myself going again when our kids are older. And that is the hope that keeps my dream alive my friends. When you enter the Land pavilion in Epcot’s Future World West, the first thing you should see are large balloons hanging overhead. You might even glance upwards at them when you are dining at Sunshine Seasons. What you might not realize is that these balloons fit in perfectly with the ideas of the Land pavilion. The large balloon in the center at the highest point represents the land itself, Earth. Can you guess from the pictures what the surrounding balloons represent? The four seasons that we experience on Earth are shown in the surrounding balloons. Icons such as flowers and butterflies are shown on the Spring balloon, whereas the sun and birds are featured on the Summer balloon. Each balloon has beautiful vibrant colors to represent the season. I must have walked by this hidden gem a hundred times before really stopping to understand how well this fits in with the Land. Perhaps one of the biggest reasons to take advantage of using a travel agent for your Disney vacation (or any other type of vacation for that matter) is that the service you are provided is 100% complimentary to you, the client. 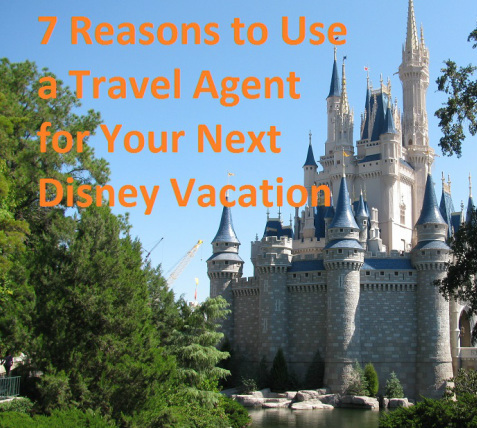 The supplier, such as Disney, pays the travel agent for the booking and the client pays absolutely nothing extra. Not a thing! It is a common misconception that you will pay fees to a travel agent and this is simply not the case. I've been to Walt Disney World specifically every year for the past 10 years and it truly is a passion of mine. I spend time keeping up to date on all the news going on at the World as well as all Disney destinations. I make sure to stay at different resort hotels each time, try new dining experiences, take special tours, and do all of the extra things offered at this amazing vacation destination. I not only do it because I love it, but I do it so that I can confidently make expert recommendations to my clients for their upcoming vacations. We all know that the internet is out there and it can offer you really great resources when planning but did you know that a trip to Walt Disney World requires more research than any other destination? Relying on a true Disney expert can save you so much time and stress! There have been so many changes at Walt Disney World in the last year with the arrival of the My Magic + system. It can get extremely confusing, especially to a first time visitor. When using a travel agent you can be assured that you will receive all of the must have info regarding these changes and how to navigate them. Not to mention I can book your dining reservations for you. Many of the hard to get dining reservations require being online or on the phone extremely early in the morning 180 days in advance of your vacation. I will spend that time securing these reservations for you, saving you the trouble of remembering to get it done, getting up early, and spending time on hold with Disney. Not only are the expert services you are receiving free, they can actually save you money. Agents are aware of all new promotions and discounts offered by the Disney company minutes after they become available. We will automatically apply any new promos that will save you money to your reservation without being asked by the client. You could wake up one day to an email saying, "I just saved your $600 on your reservation" or "I just got you the free dining promotion." The best part is, you would not even have had to know such a promo existed. You would not receive this service if you booked direct yourself and you could miss out on some great savings opportunities! Often times agents offer special incentives or thank you gifts for choosing to book your vacation with them. Some come in the form of Disney gift cards or special prizes for the kids like plush toys, autograph books, etc. I believe that once you contact me and receive the expert friendly service, prompt responses to your questions, and overall attention to detail you wouldn't need the incentive to want to book. But I still like to thank my clients for their trust and loyalty. New to the parks and not sure how to make the best use of your time? Want to make sure you hit all of your must dos? I can help you plan as little or as much of your vacation as you would like me to. I understand that some people like to do their own planning. If that is the case, just say the word and I will let you do your thing. However if you feel the need to have help planning out every detail, that is something that I love to do! Lastly, using a travel agent is a way to support a small business/individual who is doing this mainly because they truly love it but also because they are using their skills to make a living. Even if you consider yourself to be a Disney expert and want to do most of your planning, using a travel agent to complete the booking helps a small business to grow and it costs you absolutely nothing more than if you were to do it yourself. The next time that you are planning a vacation to Walt Disney World, Disneyland, Disney Cruise Line, or any other vacation, please consider contacting myself or any of the wonderful agents at Magical Vacations by Me for all of your travel needs, big or small. We really do appreciate it! As you are leaving Expedition Everest at Disney’s Animal Kingdom and heading further into Asia you may see a shrine to your left. This is a popular photo pass site as the background for your picture is Expedition Everest - Legend of the Forbidden Mountain. Like most things at Walt Disney World, the shrine has a purpose. The outline of the shrine represents the shape of the mountains you see in the distance. However, you might not realize this trick when you are standing to the left or right of the shrine. When standing directly in front of the shrine and quite a ways back, slowly bend down. You will find that the shrine aligns exactly with the mountain range behind it. Want to know another cool secret? There is also a telescope near the shrine. When you look into the telescope you will find that it is focused on the mountain to the right of the highest peak. That peak is actually Everest whereas the highest peak is the Forbidden Mountain. So today's original plan was a half day of Disneyland as we had an Angels game to go to in the evening. However due to last night's turn of events, we did not rise and shine quite as early as what was previously scheduled. I was extremely tired and still pretty scared that going about our business might threaten the safety of our unborn twins. I spent most of the morning into the early afternoon resting. It wasn't until about 1:00 pm that we decided to get up and around and head back over to Disneyland. There was still so much I had wanted to do, but I got used to the idea that it just wasn't going to happen. So I decided I would stroll around Main Street a bit more and do some exploring and I really wanted to get on it's a small world. That was my goal for the day as we would have to leave around 4pm so I could rest a bit before the Angels game that evening. The very first thing we did when we arrived was Great Moments with Mr. Lincoln. It's a funny thing touring a park when you are pregnant. Especially having had a scare like I did. Even though I didn't have the time to do the things I had always dreamed of doing, we did end up doing quite a few things I may have skipped on a normal trip due to time constraints. Great Moments with Mr. Lincoln is probably something I would have skipped in my rush to get in line for Space Mountain or something similar. It's not that I am not interested in it. Being a huge fan of Walt Disney, it is not every day I can see something so important to Disney's history. But let's be honest, the place was dead and it's not on most people's top ten list. However, I was so grateful we took the time to sit down and watch the show. After strolling slowly around Main Street, I decided we would take the train over to the Toon Town stop in order to get on it's a small world. Due to Richard Sherman being in the parks the day prior and the 50th anniversary of the attraction events going on, it was over an hour wait when we tried to go on it the day before. I was hoping some of that would have died down and it's a small world would be more like the 5 to 10 minute wait I am used to at Walt Disney World. I was right. It was a 10 minute wait and I was thrilled that I would not miss it. I have to say, I sort of enjoyed the Disney characters scattered throughout. It definitely made the ride a little more fun trying to find them all. I even sort of got my Disney hating husband into it. I would spot one and see if he knew who it was. He didn't do too bad actually. It's sad but this actually concluded Day 2. We walked slowly out of the park, making sure to take in as many sights, smells, and sounds as possible. This would be the last moment I was able to be inside Disneyland park. I definitely did not get to everything I had wanted to, but the important thing is....I was there. I stood there....where Walt once stood. It was an amazing experience and still to this day I can't believe I got to go. I am anxiously awaiting a time when I can return and truly experience the park without any issues. But the report is not quite over yet. We still have to get to California Adventure. Stay tuned for the third and final day in our Disneyland trip report. Book your next vacation with us and rec﻿eive up to a $100 Disney gift card! Contact katy@magicalvacationsbyme.com today for a free no obligation quote. Visit and like our Facebook page to stay up to date with all the current promos & offers. So the day was finally upon us. The day I was able to step foot into a place I had been dreaming about, well my entire life really. Disneyland....the place where Walt once stood. It was surreal really and I still can't believe I was able to accomplish it. My husband and I were trying to get pregnant. We found this perfect week in April where his favorite baseball team, the Detroit Tigers, would be playing not only the L.A. Dodgers but also the San Diego Padres in the same week. We like to fill our vacations with compromises, making sure to fit in things that each person is interested in. So he got his baseball and I would get my Disney fix. We thought to ourselves, if we don't do this now we will have a toddler and another newborn and may not be able to go on a vacation for several years. So we booked the trip! Fast forward to March and I discovered that I was newly pregnant. No big deal right? Pregnant people can still go on vacation. However this time it was a little different, we found out that it would be twins! After clearing it with our doctor, we were still able to go. I just knew this trip would be a little different that I had originally planned. A lot of taking it easy and most likely not getting to all of the things I had been dreaming about doing. But hey....I still got to do it! So day one of Disneyland was really about day four of our vacation and man was I already exhausted. It didn't help the fact that I was still struggling with food and morning sickness. Being on vacation and not wanting to eat is never a good thing. But I must power through it because I am about to enter the most magical place on Earth. We got up bright and early and took the hotel shuttle over to the parks. We stayed at the Holiday Inn Anaheim because it was quite the savings over some of the closer hotels within walking distance to Disneyland. We also wanted to be there because the entire trip was not just about Disneyland. It was close to the freeway which made it easy access for our baseball destinations. The hotel was great and the shuttle was extremely affordable and easy to use. A couple of the actual times waiting for the shuttle was somewhat of a drawback. But I would do it again for the money saved for sure. I feel like I know quite a bit about Disneyland just from being the overall Disney nut that I am. I have read quite a bit about it. I listen to podcasts about it. I keep up on the news and happenings. I knew about it's smallness compared to Walt Disney World, but even after all that it was still so interesting to actually walk up to the gates and see just how close Disneyland is to California Adventure. It really all is right there, packed in. We decided to start our trip at Disneyland park. As soon as I got through the gates, I immediately began to cry. I was here! We spent a good amount of time strolling down Main Street, taking in the sights and smells and taking pictures. We made sure to stop into Starbucks for a refresher on our way down the street. The buildings naturally had an older look to them than what we are used to in Walt Disney World but it was all so very quaint and beautiful. Of course the first thing out of my husband's mouth when he saw Sleeping Beauty's castle was, "It's so small." Which yes, he is correct, it is very small. Not quite as grand and as much of a show stopper as Cinderella's castle but it has such charm to it. I almost might dare say that I liked it more. So as we made our way to the hub, we stopped to discuss just exactly it was that I wanted to do first. Being pregnant puts a new perspective on things because all of a sudden we are very limited to what we can do. But it also can be a blessing because it was no longer going to be a rush to fit it all in. I was feeling quite tired so I thought I might like to sit down somewhere. I decided that Adventureland was the first destination and for our very first attraction, the Enchanted Tiki Room! This was one that I don't always get to while at Walt Disney World but definitely wanted to experience while in Disneyland. I was so very glad that we did. I absolutely loved it and have a new found love for it. I mostly loved the waiting area. Such a gorgeous little nook with a lot to look at and discover. In my eyes it was an improvement over Walt Disney World, although I suppose WDW's queue allows for more people. Our stroll through Adventureland was quite lovely. I wanted to make sure I was able to check out Tarzan's Treehouse but I was feeling a little tired so we made a mental note to possibly come back if time allowed. We passed the Jungle Cruise and Indiana Jones (which was closed) as we headed to my very favorite attraction in all of Walt Disney World, Pirates of the Caribbean. Being a WDW fan, you often hear how Disneyland's Pirates attraction is far superior to the World. I had to test out this theory for myself and see which one I preferred. I would have to say all of those opinions I had heard were spot on. While I think that the actual base of the ride is pretty similiar, I did really enjoy the loading area. It seemed strange to not walk through all of the dark corridors on your way to the loading, but I really liked how it was set up. Also floating past the Blue Bayou restaurant was definitely cool and really made me want to eat there. Obviously the two drops are a plus, but for this pregnant momma there was one that was a little bumpy which got me a bit nervous. RIght as we passed the scene where the pirates in jail are trying to persuade the dog to bring them their jail key, we were suddenly stopped. A CM came over the loudspeaker to let us know they were experiencing stormy seas. Nothing too shocking as it has happened to me before on several rides. We were content to sit and wait a while. However after about 20 minutes of the same speech over and over again from the CM on the loudspeaker, we began to get just a little anxious. Then at around the 30 minute mark, a CM came out from one of the doors on the side to tell us that a boat was stuck on one of the drops and they were working on evacuating those individuals. The place where we were positioned was extremely close to the shore's edge. I was starting to thank my lucky stars that we were at the end and not the boat on the drop. At least I was able to get through the entire ride. Finally after about 45 minutes, they decided they would get us all off the boats. We were able to get on to the edge and walk through a door, up the stairs and out the back way off the attraction. We were handed a fast pass good for any attraction, even those without fast pass distributions. It is at this moment when I realized how impatient and rude people really are. First of all this one dude jumped off the boat and exited himself before they came to get any of us or said it was ok. Totally rude. Then I could hear several people in many boats complaining about the situation, expecting that Disney would refund their entire day's ticket for their time wasted, etc. I must be a very laid back person. I realize that yes it was a huge time waster and of course I was disappointed about the time I also lost, but man.....accidents happen and you just have to roll with it. I would hate to be a CM in these instances. Yikes! I was extremely happy with the fast pass we received. The park was getting very crowded and I knew I would not want to wait for Peter Pan's Flight. It also does not have a fast pass distribution. We decided we would use our fast pass on that once we made it over to Fantasyland. We also went on the Haunted Mansion which did not have a terrible wait time. The attraction itself all seemed very similar to Walt Disney World. I will say that I think I like the attraction at WDW more. While the building in Disneyland is really very beautiful and elegant looking, I think WDW is spookier and more mansion-like. Next we walked through Frontierland while we talked about possible lunch options. My crazy stomach issues making it difficult again, I just could not figure out what sounded good. I bet my husband is glad now that I am over that phase. It was awful! And probably extremely frustrating to the individual who just wants to eat food! We finally decided on River Belle Terrace over in Adventureland. I ended up getting the salmon with potatoes and my husband got some type of pulled pork sandwich. I only got through about less than half of it. I decided on our way out I would grab a Dole Whip to walk around with. We had already been through the entire Frontierland and Critter Country. We decided not to do any attractions there. I would have liked to get on Winnie the Pooh but the line was quite long. So next stop was Fantasyland. We left the Dole Whip stand and walked through the center of the castle. We first got in line for what I think might be the absolute cutest attraction in any park I've ever been in. Yep....you guessed it....Casey Jr's Circus Train! I mean really, how adorable? For me I felt like a giddy child. For my husband who is 6'6" and very macho, he felt like a giant fool. But I told him, hey I am pregnant, get over it! After this adorable ride, we were able to get on Snow White's Scary Adventures and Pinocchio's Daring Journey without much of a line at all. Snow White was exactly what I had expected. I have a strange obsession with Pinocchio's Daring Journey. Ever since I was a small child and learned that there was an attraction based on Pinocchio at Disneyland, I have always been oddly interested in it and have always really wanted to check it out. Don't ask me why, Pinocchio is not even near the top of my list of favorite movies. I must be a weirdo, but I wanted to get on this ride something terrible. So my impression of it do you ask? Super CREEPY! Ok...that was just strange. In fact we were sat in the same car as a mother and her 4-6 year old and as we were passing through Pleasure Island, this kid was crying hysterically. I don't blame her, I wanted to cry myself. I mean, where did this come from? Yikes! Next up was our fast pass to Peter Pan's Flight. Another one that I felt was similar to WDW. Although I think WDW wins on this one, as the scene where you were flying over London was extremely disappointing here. Except there is a part where it's pitch black and all stars that was pretty sweet. Hmmm...now I can't decide which I like better. They both have their superior moments. Next we hit up the Sleeping Beauty Castle Walkthrough which was just gorgeous. I wish there was something like this up in the castle at Walt Disney World. I loved all of the panoramic scenes from the movie and the music piped in for each different part of the story. The Alice in Wonderland ride was unfortunately closed for our trip which made me very sad. Of all of the Fantasyland attractions, this was the one I wanted to get on the most. Oh well, guess I gotta go back. Another awesome part of today was that it was the 50th anniversary celebration of it's a small world and Richard Sherman was going to be having a sing a long and leading the parade. It was almost time for this so we headed over towards the ride to check it out. Turns out it wasn't much of a parade or sing along. There was a small band and he passed by in a car as he was singing the song into a microphone. But hey, it was still cool to see him. And what I didn't realize until the next day was that there was a 50 displayed on the front of the attraction that appears to only have been there for that day. When I saw it, I thought it might be there all year or something, but alas it was gone the very next day. We checked out Mickey and the Magical Map, which I found to be quite pleasant but I think my husband wanted to gouge his ears out. But, we needed a break from the sun and from walking, so it was a nice pit stop for sure. Afterwards we briefly walked into Toontown to see what all was there. I thought the area was just adorable and much better than the old Toontown fair at Walt Disney World for sure. Next up was Tomorrowland. Now I've never been a huge fan of Tomorrowland at Walt Disney World and my impression did not change here. I am not sure what it is but I guess I am more into the fantasy and theming of the other lands and not so much into the contemporary looking theme of the land of tomorrow. We barely spent any time here. It was nearing dinner time and I very much wanted to get on the monorail, so we thought we might take the monorail over to Downtown Disney to find something to eat and then come back later for Fantasmic and the fireworks. This unfortunately was where disaster stuck. We had just sat down at the House of Blues, had our meal set in front of us, when I began to feel extremely strange. I definitely could not eat and things just seemed very off. I thought perhaps I was just tired but long story short, without getting too much into the details of it all, I experienced what I thought at the time was a miscarriage. We had no choice but to call 911 as we were without transportation and I didn't think I would be able to walk anywhere to figure it out. We were taken to the emergency room and as I am sure you have already figured out, this ended our day at Disneyland. After four hours of tests, resting, and care an ultrasound discovered that both babies were still ok and had heartbeats. I had suffered what was known as a threatened miscarriage. I at first felt guilty that perhaps the amount of walking had something to do with it, but they assured me nothing we did could have helped. I was advised to take the rest of the trip a little easier but no real restrictions were given. We got back to our hotel at around 11 that night and got some much needed rest. Day two's report will be much shorter, but there was indeed a tiny day two to be talked about so stay tuned for that! 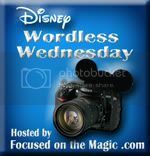 I absolutely love this week's "Wordless Wednesday" blog hop theme - A Different Perspective. It's definitely something I try to do frequently when I am lucky enough to visit the World. I try to look at things in a different way or take an interesting picture of something common to show it in another light. Now I am no photographer and I don't always do it well, but I definitely like to document my trips in pictures. Anytime I can snap something interesting that I may not have noticed before to add to my photo memories, is a good day for me. I'm a huge fan of signage around the parks. I tend to take more pictures of signs than anything else. A fun challenge is to try to get your background to incorporate in some way with the sign you are taking a picture of. A favorite of mine was from the Food and Wine Festival at Epcot in 2010. 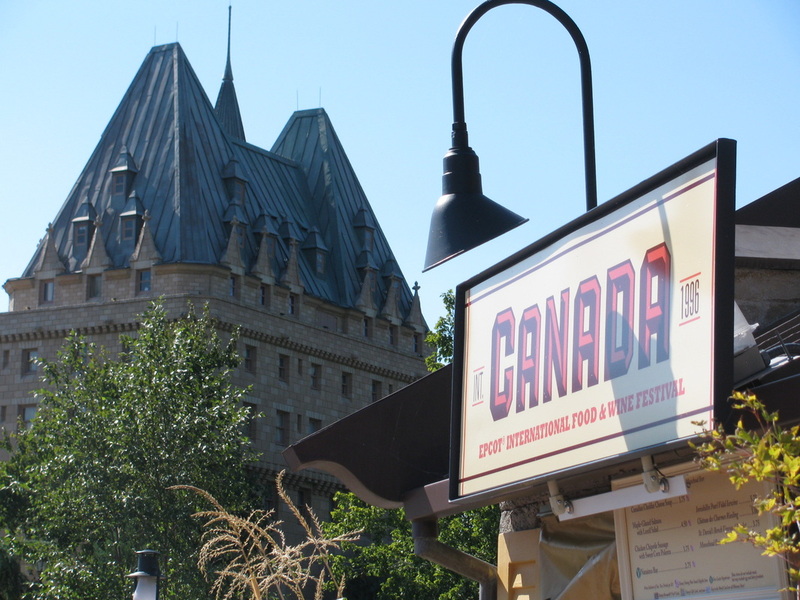 I liked lining up the food kiosk's sign with the pavilion's beautiful architecture in the background. Not a masterpiece by any means, but just a little different perspective. Want to link up with the Blog Hop? Visit Deb over at Focused on the Magic. Yes I know...it has been months since I've posted on the blog. I'm not even really sure where to begin. It's been a rough couple of months and life certainly happened. And it all happened shortly before our first ever trip to Disneyland. The trip had been booked for months, when about a month before we were to leave I found out that I was pregnant. Now, it wasn't a shock, we had been trying for quite a while, the shock came however at our very first ultrasound when we learned that there were two! Since we already have a toddler, the idea of two more was well....terrifying to be honest. Not to mention the extreme sickness which followed shortly thereafter. And no folks, it couldn't wait until after we took our trip to California. It had to happen right before and throughout the entire trip and several months following. So a long long long story short. I've been a little out of it, still trying to work full time and chase after a crazy two year old. The blog has fallen by the wayside and I apologize. But I feel that I am in a good place to say, I want to come back. And now that things are running a little smoother, I think I can commit to at least weekly updates. And a huge thanks to my pal Sean from the Enchanted Tiki Talk podcast. He basically guilted me into updating the blog. No just kidding, he gave me a goal and I think that is exactly what I needed! But enough complaining....I WENT TO DISNEYLAND!!!!!!!!!!! I still to this day cannot believe it ever came true. And I suppose it really couldn't have come at a better time because once these twins pop out, I won't be going anywhere ever again. Our trip was scheduled for April 8-14. Since my husband is a Disney-hater...I had to make this trip enticing for the both of us in order to let it come true. So we made a grand plan of seeing four major league baseball games at three different stadiums, as well as a two and a half days dedicated solely to Disneyland. We stayed in Anaheim the entire trip at the Holiday Inn Anaheim, rented a car in order to get to the baseball games in Los Angeles, Anaheim, and San Diego and then took the hotel shuttle to Disneyland. I am going to save the full trip report for it's own dedicated post. Since I had to babble on and on about my absence from the blog I feel it's only right to give the full report it's own space (plus there is just so much to say). But I want to first express just how much I fell in love with Disneyland. Being a Walt Disney World junkie and loyal fan, I would hear about how small Disneyland is, and I really thought I would enjoy it but not quite as much as my beloved Walt Disney World. I could not be anymore wrong! In fact, there were many portions of it that I loved even more and just standing in the place where Walt once stood was enough to bring me to tears. And I suppose it could have been the hormones. Stay tuned for the actual trip report and many many more photos of our time spent in one of the most beautiful, awe inspiring places I have ever been. It's my favorite time of the month! You guessed it! It's KILL REFURB MARRY time with Mouse on the Mind and This Happy Place Blog! If you aren't familiar with the rules, every month they choose a category that relates to Walt Disney World. You then have to choose within that category what you would kill, refurb, and marry. This month's category is WORLD SHOWCASE COUNTER SERVICE LOCATIONS. OMG how tough is this category? The World Showcase has got to be one of my favorite all time places to eat. I can think of at least four that I would take out on a date right this second. So how can I possibly marry just one? Yeah yeah...quit complaining....just choose! I had to kill something and the Lotus Blossom Cafe in the China pavilion just happens to be my least favorite of all. I struggled between the Liberty Inn and this one but in the end it came down to the fact that I'd choose Liberty Inn before I would choose Lotus Blossom Cafe for a meal. It's not that I have ever had a terrible meal here but it just really isn't all that unique. To me it is typical Chinese food that you could find at any little take-out restaurant at home. There is nothing that jumps out as something I must try or I'll never forgive myself. Also there is really nothing regarding the location or atmosphere that has me jumping out of my chair. All in all, it's just fine. I hate to tell you this but fine is not going to cut it when we are playing Kill Refurb Marry. Sorry folks. I have to refurb this one even though it's on my list of places I'd like to get involved with on a more personal level. The reason is simple. It's just tiny. And it only serves one entree. Now some might call it quaint which I wouldn't disagree with. The smallness might contribute to the hidden gem aspect of this actually fantastic little eatery. But I'm refurbing it anyways because well they told me I had to pick something and so I am! What if they could add a couple more options to the menu while still keeping it authentic? It seems to happen from time to time that one person in your party doesn't care for fish and chips, therefore you feel guilty for wanting to enjoy the deliciousness of fish and chips! If they had a few more things, maybe those mean people that I hang out with would let me go there more often. One other refurb option could be to add an indoor seating area as well as more outdoor seating options. Expand a bit, I dunno. Ok so I am assuming that La Cava or Tutto Gusto is cheating.....right? I'm more inclined to marry someone after I've had a couple of margaritas or glasses of wine. But in all seriousness, Tangierine Cafe????? WHAT???? Who would of thought that I would be a fan of Moroccan food? Two words people. Lamb Wrap. I am forever in love with the Tangierine Cafe and I don't care who knows it! I am only ashamed that it took me so long to venture out and try it. Not only is the food fantastic, but the seating area is really gorgeous inside and out. If you can nab a table just outside of the door under an umbrella next to the gorgeous fountain at the entrance to the pavilion than you have hit the jack pot my friend. Now I will admit, I've yet to experience Spice Road Table. I have a feeling I will like it even more or at least just as much. But until I get to try that one out, I am sticking with my new found love. Want to play along? Join the Blog Hop below! And make sure to check out all the other great sites who played along too! The Sassagoula Steamboat Company & Magical Vacations by Katy has teamed up with some awesome fan pages and blogs to bring you a chance to win 1 of 9 awesome Disney prizes! Here is what you have a chance to win when you enter! Giveaway Details: The Giveaway begins at 12:15AM on Friday, February 21, 2014, and continues until 11:59PM on Sunday, March 2, 2014. The winners will be selected from all the eligible entries on Monday, March 3, 2014, and will be notified via email to the email address specified in their entry information. The winners will have 24 hours from the time the email is sent to them to claim their prize, and if they fail to do so, another winner will be chosen. The winners may also be notified via social media avenues, but they must claim their prize via email. The giveaway is only open to people aged 18 years of age or older living in the United States only. To enter, complete the entry details you find in the Rafflecopter widget , and good luck everyone! There are entries for every day of the giveaway, so keep coming back to get your maximum number of entries!